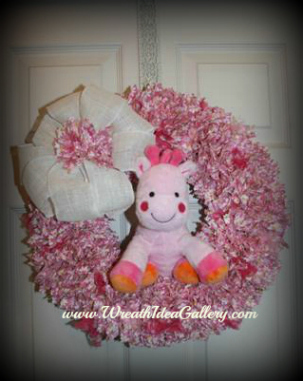 This punch fabric wreath is so versatile; change the fabric change the look. 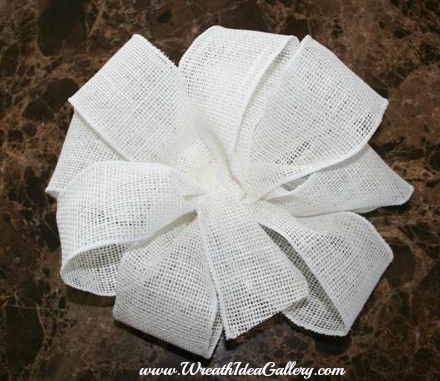 This is good for any occasion, however because it is material you will probably want to hang it indoors. 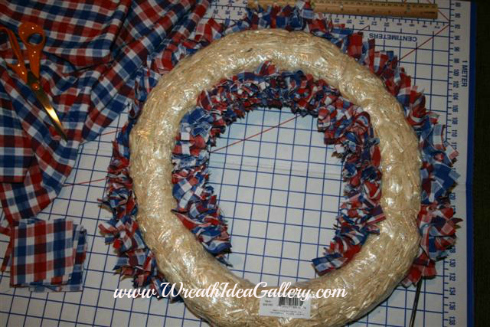 Start with a straw wreath form. 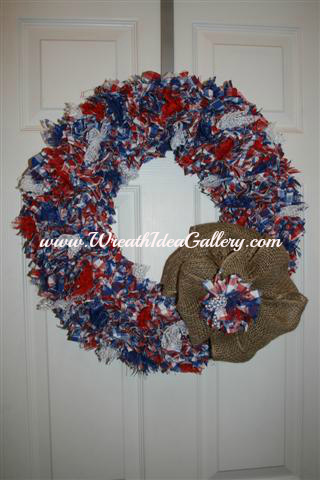 Above baby wreath is on a 14" and the patriotic wreath is on a 16"form. Fabric: Pick out your fabric according to the occasion you are making it for. 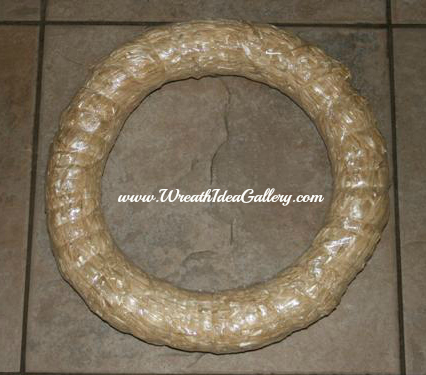 You will need approximately 5 yard of material for a 14' wreath form. Seven yards for the 16". Give or take depending on how tight you make your punches. You will need a yard stick. Scissors or pinking sheers. 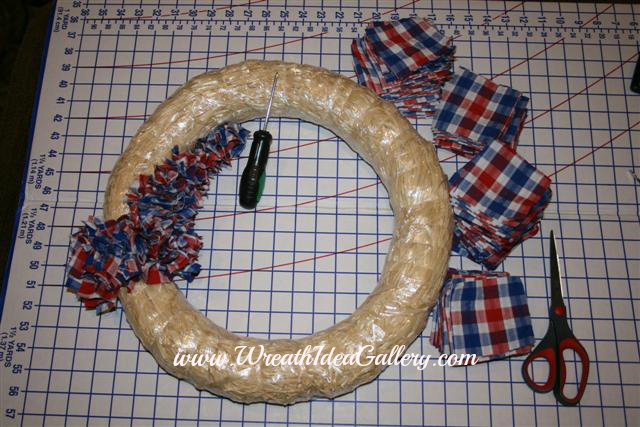 I used scissors for the patriotic wreath above and pinking sheers for the baby wreath. Slightly different look, depending on your preference. Flat screw driver to punch fabric into the form. 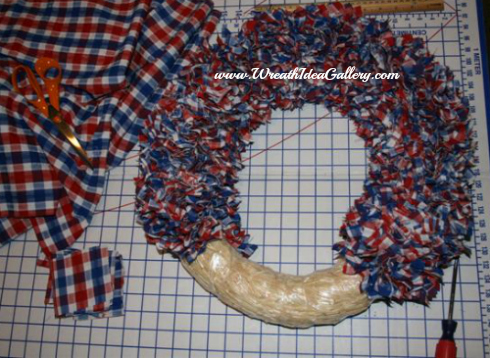 The punch fabric wreath is a very simple wreath but it does take time. You will want you plan to invest some time into this project. 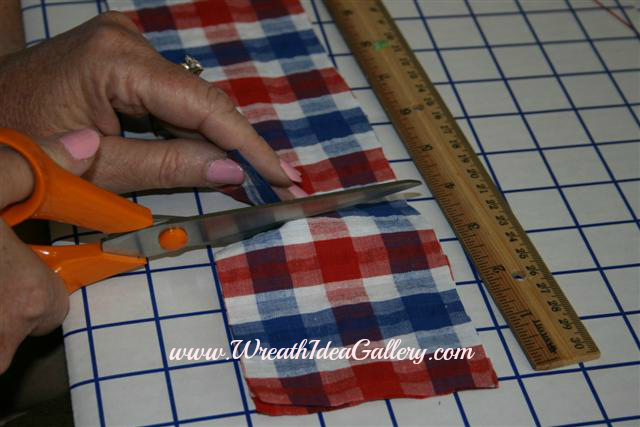 Start by cutting your fabric into small squares. I cut mine squares into three and a half by three and a half. I cut a lot of squares and then started punching, then went back and cut another batch and then punched them in. Two reasons I did this; one it gave me a break from cutting and punching because they both are very repetitive when I got tired of one I would switch back to the other. Second, not knowing exactly how many squares I would need, I really did not want a bunch of squares left over. Even if I only had one strip of material there is more I can do with that verses a bunch of squares. 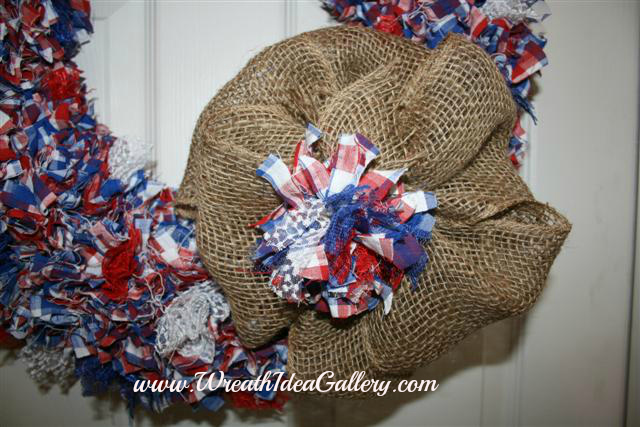 On my patriotic wreath I had enough extra that I was able to make my rag wreath. 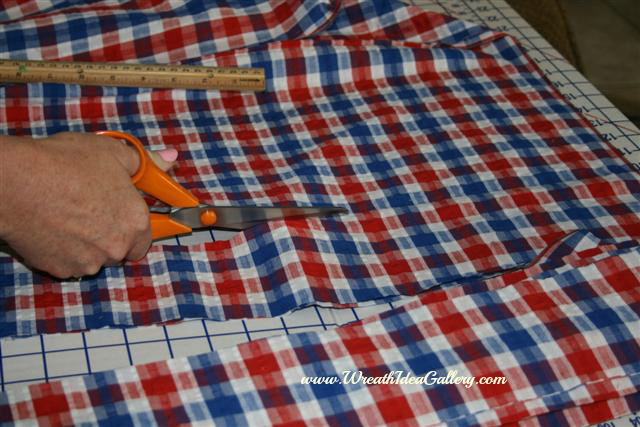 You start punching the fabric squares into the straw about a half to one inch with your screw driver. 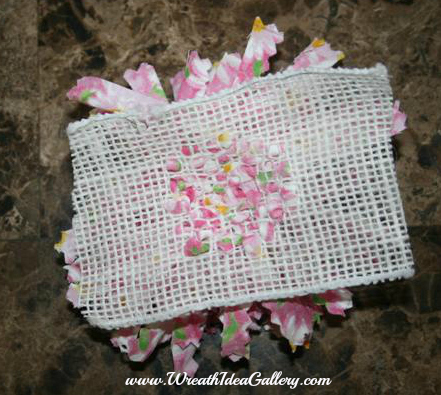 You will want to put them close enough together to cover the straw and to get a full look. Work your way around the top and sides. 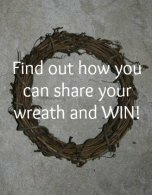 Continue until you fill the entire wreath. You will want to leave the back open so it lays flat against the door or wall. 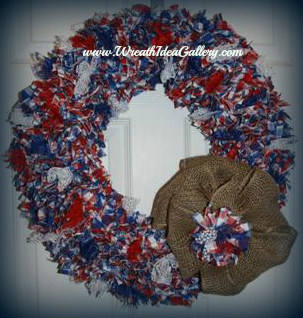 I also added some squares of red, white, and blue lace squares to add some texture to my wreath. 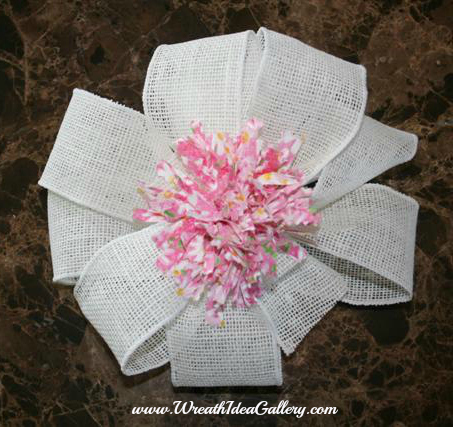 I made a burlap bow and then added this cute raggy flower for a center to coordinate the material into the bow. 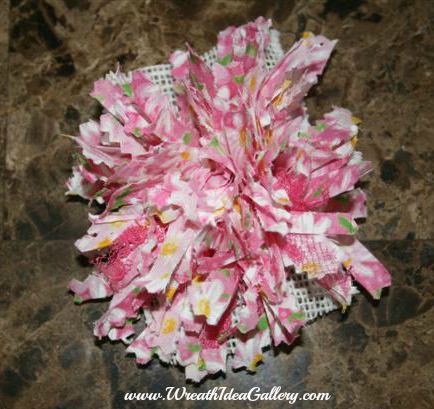 This is a fun and easy flower to make. All finished and ready to hang. 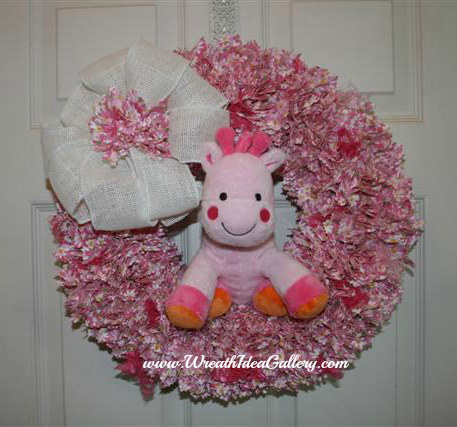 Submit your punch fabric wreath so we can all see your design. Make sure you include any tips and tricks.